A fame-seeking cat crashes a reporter’s live shot and lands on the RidicuList, where she’s got some company. The tax cut extension is going to expire, causing renewed policy arguments between President Obama and lawmakers. Anderson Cooper talks to a shark researcher about recent great white shark sightings near swimmers. Obama's and Romney's views differ over extending the Bush-era tax cuts. Cornell Belcher and Bay Buchanan discuss. CNN's Sanjay Gupta reports from Cambodia on a mysterious illness killing children there as doctors search for answers. The latest high-profile Hollywood divorce has put the spotlight back on Scientology. A former member of the church talks about her own divorce and what it did to her family. CNN's Brian Todd reports on additional sightings of great white sharks off Cape Cod – and what they mean. Reporter's Note: I write to President Obama each day, whether it helps my poll numbers or not. To borrow a phrase from our friends at Nike, just do it. I wish you, and your fellow Democrats, and Republicans would quit dancing around all these big issues that no one wants to tackle in an election year and just start doing your jobs. I don’t mean to be a jerk about it, but when you sang your latest chorus of “let’s tax the rich” today, I couldn’t help but think: What about the rest of the tax code? You and everyone else in Washington seem to admit that we need to seriously reconsider the entire equation of where we get our taxes, who pays them, and why. And yet whenever an election is looming none of you appear ready to sit down at a negotiating table with live TV cameras on you and discuss what we might do. Heck, you won’t even sit down in private and hold those talks. Why? Because it might affect the election. Because both parties believe, oddly enough, if you all do your jobs with good intent, courage, and fidelity to your duty, voters might not like you the next time they go into the voting booth. Problem is, it’s always election time anymore. There is always a primary, or a general election, or a mid-term, or a runoff, or a recall, or something brewing and the whole lot of D.C. political types use that as a ready made excuse to avoid unpleasant subjects. So like I said, I wish you all would just do it. Go ahead and tackle the tax code. Tackle the remaining elements of health care reform. Tackle Social Security, the Alternative Minimum Tax, and every other land mine waiting out there that you all fear so much. After all, the more you all push these items into the future, the denser the minefield becomes. Sorry to be such a downer on a Monday. Call if you can. Dr. Sanjay Gupta visits a young girl hospitalized in a Cambodia. An illness that quickly turns deadly is claiming the lives of young patients in Cambodia. Doctors at the Kantha Bopha Children's Hospital who regularly treat conditions like Dengue fever, malaria and tuberculosis say they've never seen anything like it. A World Health Organization representative says many of the children died within 24 hours of being admitted to the hospital. The sickness begins with a mild fever and then rapidly impairs the body. The speed of deterioration and other symptoms are baffling to medical experts. An enterovirus associated with hand foot and mouth disease has been linked to some of the patients, but that's only one small clue and doctors aren't sure what it means. While parents try to maintain hope, medical experts are working to uncover a pattern and find more pieces to the puzzle. 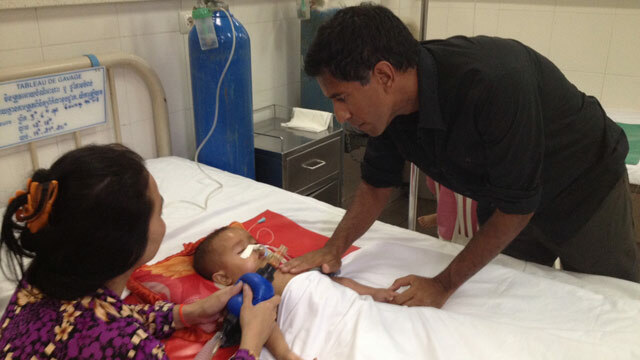 CNN's Dr. Sanjay Gupta traveled to Cambodia and was granted access to the intensive care unit. See his report to learn more at 8 and 10 p.m ET on CNN. Update: Watch Dr. Gupta's story below.